Foot pain is an ailment that many people suffer from. Unfortunately, the discomfort that the pain causes can easily make walking around feeling like a chore. One of the most common foot problems experienced is a heel spur. A heel spur is a calcium deposit that causes a protrusion of the heel bone. Most of the time, heel spurs are associated with a condition called “plantar fasciitis,” which is an inflammation of the tissue on the bottom of the foot where the heel bone connects to the ball joint. Athletes whose sport includes a lot of running and jumping are prime candidates to suffer from heel spurs. This means that, fearing pain afterward, they don’t work out as hard or as often as they want to. But the good news is, there are many shoes on the market that are designed to help bring relief from heel spurs, while providing all-day comfort at the same time. What are five of the top shoes that will help alleviate heel spur pain? The Brooks Addiction Walker Walking Shoes provide ample support for low arches and are comfortable and durable enough to walk around in all day. They have a casual, yet contemporary design, making them stylish enough for any occasion. These shoes are made of leather with a synthetic sole, and they come with a removable sock liner for your added convenience. They additionally feature Hydroflow technology, which aids in shock absorption while you walk around. A wedge support around the heels helps to more evenly distribute weight to the balls of the feet, making these shoes great for those who want better arch support and need to take pressure off their heels. Plus, the wide toe box area gives you all the room your toes need to feel comfortable and not squeezed. Finally, these are the best shoes for plantar fasciitis of all five options that we reviewed. Made from leather, the Rockport Eureka Walking Shoes combines good looks with comfort in one package. The shoes are specially built to cushion your foot, so you’ll experience less foot fatigue throughout the day. These shoes provide superior heel stability with thick padding on the collar and tongue, while also featuring a breathable mesh lining that easily wicks away moisture. A removable insole and a rubber bottom sole additionally provide extra foot support. The Rockport Men’s Eureka walking shoes also come in a wide size, so they are ideal if you have wide feet. Heel spur pain is also better controlled with these shoes because they have good arch and heel support. A lightweight athletic sneaker that looks just like a classic running shoe, the Adidas NEO Men’s Cloudfoam VS City Shoes feature breathable mesh and an outsole that grips the ground well while you walk or run. These shoes also have a cloudfoam footbed to provide extra cushioning, making them great for everyday use. Other features include a soft plush tongue and collar and a cloudfoam sock liner for superior comfort. They are great for running and walking, and they will fit you well if you have high arches. The shoes are also comfortable enough to wear all day at work, especially if you are standing on the job for many hours at a time. As an added bonus, they come in several color combinations, such as red, white, and blue. Now that’s what I call patriotic! The Skechers Performance Go Walk 4 Incredible Walking Shoes are extremely lightweight with a soft fabric lining and breathable upper mesh to help wick away moisture. The memory foam interior gives you great arch support and makes you feel like you are walking on air. These shoes also have a soft insole that will provide you with extra comfort in the heel area. You will find exceptional cushioning in the sole of the shoe. One other thing to note is, if you have wide feet, these shoes are the real deal. Finally, these Skechers easily slip onto your feet since you don’t have to bend down and tie laces. If you are looking for some good shoes for heel spurs, then look no further than the Skechers Performance Go Walk 4s. The Adidas NEO Lite Racer shoes are lightweight, weighing in at only ten ounces. Made from rebound foam, these shoes conform to your feet as efficiently as a custom-made shoe. Plus, they have a soft mesh, which gives the shoes exceptional breathability while making them stretchy and easy to put on. Other features include a removable cushioned insole and a rubber outsole for extra durability. 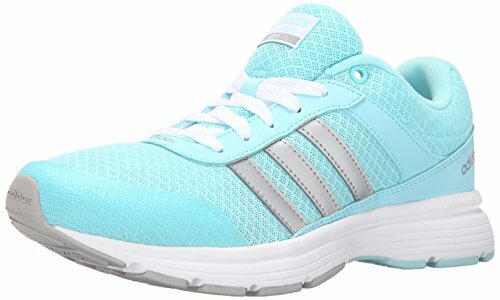 If you are looking for a shoe that will be comfortable all day long for standing or for running errands, then these Adidas shoes will easily fulfill your desires. Wrapping it Up: What Are the Best Shoes for Heel Spurs? Heel spurs don’t have to be an incredible pain when you wear the right shoes. They might not fix the issue entirely, but at least they will lighten the load! Thankfully, you have several types of shoes to choose from that are designed not only to help you feel better but also to allow you to tackle your daily routine without worrying about throbbing pain. Personally, we love the Brooks Addiction Walking shoes in terms of comfort and durability for those serious walkers out there. However, if you are looking for a more casual shoe, go with the Rockport Eurekas or the stylish Adidas Neo Walk Racer casual shoes. Make the decision today to invest in your health. Isn’t it time you got some shoes that were pain-free?